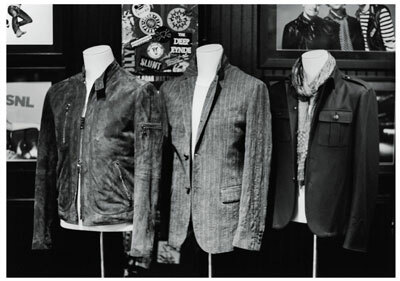 Few designers can be having as much fun as John Varvatos. He’s found a way to blend his passion for rock ‘n’ roll with a successful high-end menswear business. Not only are his clothes inspired by rocker fashions, he also gets to hobnob with musicians and, once a month, present up and coming bands in the store he opened two years ago on the site of CBGB, a legendary music club on the Bowery in lower Manhattan. He kept most of the graffiti-covered walls intact and, along with his t-shirts, jeans, jackets and other apparel, he sells vinyl records and vintage turntables. His eight other stores throughout the United States—including one in East Hampton—share the vibe, as do his products sold in department stores here and abroad. This year, he’s celebrating the 10th anniversary of his company, which has grown to include belts, bags, shoes, glasses, watches, skincare products and fragrances, and which he reluctantly—as he confesses in this interview—named after himself. We met with Varvatos at his Bowery branch—where a couple of Canadian band members he once met happened by and stopped to chat—and then repaired to a coffee shop across the street to find a slightly quieter spot than his music-filled store. At 55, he easily carries off his own classic-edgy look, which GQ last year described as “Sinatra meets Slash.” The elements: Low-cut boots, slim black jeans, white shirt, black vest, long scarf, large-dial watch on one wrist, silver and leather bands on the other. Surprisingly unassuming and unguarded, he spoke about his modest beginnings in Allen Park, a suburb of Detroit, his lifelong love of music, and his rise from a teenaged store clerk who wanted to impress girls to award-winning, world-renowned designer. // Tell me about your early life. I grew up in a very, very humble household. I had four brothers and sisters, so there were seven of us in a little three-bedroom bungalow—it was about 800 or 900 square feet—with one little bathroom. // What did your parents do? My father was an accountant, and my mother had her hands full with five kids. // At what point did you get interested in clothing? When I was in high school, I understood that when I dressed a certain way, that it worked well with girls. So that interested me more than anything. I was always interested in clothing in the sense that, as a kid watching [rock] artists either live or on television, it was always a treat to see how they were dressed. // Did you have dreams of being a rock star? I think everybody at some point has a little fantasy about that. But I didn’t have any talent. It’s tough to be a rock star when you’re not musically inclined. // Did you try? I played in a band. I played guitar and I sang. But we weren’t any good. We did small things. That was in junior high and high school. // Do you still play at all? I still mess around a little. I don’t consider it playing, really. But every once in a while, when one of the musicians we have playing asks me to join him onstage, somehow I figure out a way to make myself look like I know what I’m doing. // Where did you go to college? I went to Eastern Michigan University and the University of Michigan. I majored in education and the sciences. // Did you think you were going to be a science teacher? Yes. // You never thought, “I’m going to try for a music career” or a clothing career? From the time I was 15 years old, I worked in a men’s store, to make money and partly to get a discount on the clothes. And always in college, I worked in a men’s store. When I graduated, I opened up my own men’s store, in Grand Rapids, Michigan. It’s still there. I had partners, and I left it after four years. It’s called Fitzgerald’s. // What made you leave? I wasn’t really thrilled with the situation, so I took a job at Ralph Lauren in Chicago, and I was a regional sales manager for them. I had about 10 states that I worked with. After about a year and a half, they moved me to New York to be head of sales for the company. That’s where I got the itch to be a designer, because I was on the same floor as the design studio. I was having merchandising meetings all the time with the design crew, and that’s when I started to go to classes at FIT here in New York. I took design, illustration and pattern making. I went for about about two years. // How old were you then? Oh, 29 or 30. // Did you start to design right away? What happened? Well, it’s a long story. I ended up leaving Ralph, and I did my own collection for a couple of years, but I didn’t use my own name, because I never thought that my name was appropriate. // Really? No, I never did. Even when I started this company, I was working for six months to try to figure out another name to call it. I think I just didn’t feel it was a name that I could see on a label. But everyone convinced me that it was the right name. I didn’t know if it was too ethnic sounding, or too hard to pronounce. // It’s a Greek name? 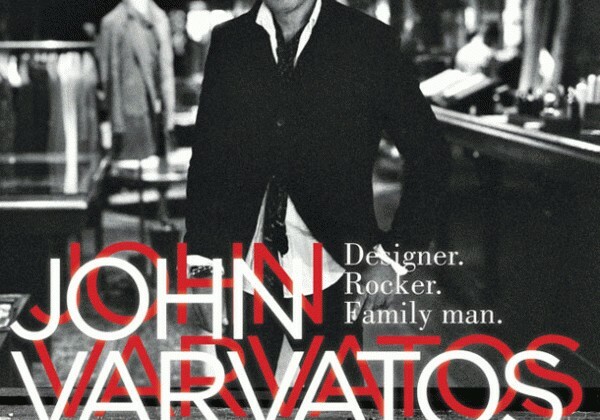 Was it always Varvatos, or did an ancestor change it? No one changed it, but the Americanized pronunciation is Varvatos [long a in the middle, as in “name”], and the real pronunciation is Varvatos [“ah” in the middle]. When I travel, in Greece or anywhere in Europe, when I check into a hotel, I always say Var-vah-tos, because for some reason they connect with that. // Can you speak Greek? I don’t speak that well now. When I was young, my parents made us go to Greek school. When we were little, every day after school—actually, three days a week—we had to go to Greek school. So you can imagine, at 5 or 6 or 7, coming home from school and then going somewhere else. Now, I wish I had paid more attention. // So what was your first company called? Keaton Chase. I had men’s and women’s clothes, and I sold to stores like Nieman Marcus and Saks Fifth Avenue, Bergdorf Goodman and Barneys. It was very difficult to fund a company like that, so when I had an opportunity to go to Calvin Klein in 1990, I became head of men’s design at Calvin Klein. And I did that for four years, and then I left and I became head of menswear design at Ralph Lauren. // And then you went on your own? In 2000, I started my own company. I learned a lot working for other people. It was like Polo University at Ralph Lauren. Even though my look is not Ralph Lauren, I got a great understanding of running a business and marketing and branding and all those things. I mean, Ralph is a genius. We have a very good relationship. // Do you try to represent your brand? Yes. It’s a lifestyle brand. I don’t know if I’m selling myself, but I’m selling my lifestyle. I don’t have an ego. I don’t need my picture on anything. I don’t ever plan on doing that. // You got a lot of publicity when you launched this store in 2008. Would you have opened another store if CBGB [which closed in 2006] had not been available? We were looking for another location. This wasn’t the location that anyone in my company wanted me to open. This neighborhood, when we moved in here, was underdeveloped. It’s still not a retail environment. The traffic over here was very light when we moved in. It’s very much a destination space. But I love that the space had all this history, and that I have the opportunity to keep music alive in this neighborhood. I don’t want to be CBGB. But I thought it was important, and that it was up to us to keep music alive in the Bowery. I had been here many times. In my college days, I drove over 13 hours to see people like the Ramones here. // Something else you’ve gotten publicity for—I read that when you were at Calvin Klein, you invented boxer briefs. Do you get royalties? No, no. When I was at Calvin Klein in the early ‘90s, I was involved in all products. It’s always a team effort, everything that you do. But I was involved in creating it. // Is that not the thing you want to be remembered for? In my company, we created the laceless Converse sneaker, which is one of the biggest shoes in history, and every sneaker company has knocked it off. I don’t mind that. Most designers would kill to have something that widely knocked off. That one, definitely, I will take 100 percent of the credit. The other thing I feel the team was very much a part of. // Do you stay mostly in New York or do you travel a lot? My life is in New York, but I travel to Europe and I try to see all of my stores at least once a year. The West Coast stores I see more frequently. But it’s difficult to have a personal life, a family life, and travel. I have a two-year-old daughter. And I also travel internationally. // When and where do you actually design? Every day when I’m in New York, I’m working on products. I work out of my design studio on 17th Street. And I think about things on weekends, and I sketch on weekends and on airplanes. Sometimes, the best time is when the door on the plane closes. There are no phone calls, no meetings, there’s just time for me to think. I need time just to think about things, to dream a little bit. When you travel, you find yourself stimulated and inspired all the time. // Do you design on paper or a computer? The only time I use a computer is for communication. But it’s not all drawing. I also drape and spend a lot of time in the factories, working with the pattern makers, or in shoe factories working with the leathers, working with tanneries developing our own leathers, and fabric mills developing our own fabrics. // And you’re married to a woman named… Joyce. She’s an art consultant. She helps people put art collections together, in the contemporary art world. We have that art in our apartment. In our lake house that we have upstate, I have a little music room there, where I have my things. I think she loves some of my real iconic music stuff, but I don’t think she wants it all over the house, which I understand. But we have bits and pieces of it all over the place. // Besides your two-year-old, you have two older children, too? My daughter is 23 and just graduated from college with a degree in criminology. She’s working in southern Florida. My son, who’s 25, is back in school in Chicago studying film. // So neither is following in your footsteps? All I want for my kids is that they do what makes them happy. // Can you explain how your designs are inspired by music? Since I was a kid, rock ‘n’ roll has been a stimulus in my life. It’s an energy kind of force. It sounds funny, but it’s true. When I get up in the morning, I put music on. I walk into the office and I put music on. I play music in my design studio. I can’t work in silence. 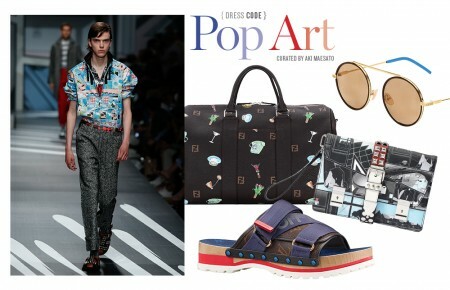 I’m also very interested in the blend of fashion and rock ‘n’ roll and pop culture. // How does that translate into what you’re wearing now? From the time I was a kid, I wore vests with t-shirts, with shirts, just like I am now. I first connected with that by seeing rock stars wear it. // So is everything you’re wearing from your own collections? Everything but my underwear. I own some vintage motorcycle jackets, but other than that, I don’t wear anybody else’s clothing. I don’t have to. // What kind of music do you listen to? I have broad tastes. I listen to old blues and jazz, and rock ‘n’ roll. My iPod has about 40,000 songs on it. And that’s a small amount of the total music I have. It’s like the clothing thing. I need to constantly be stimulated and find new things. // Do you look at what the bands are wearing? Yes, yes. Sometimes it has no influence at all. Sometimes it’s just the attitude. And sometimes I’ll go back and pull out old album covers for vinyl records. I’ll put them on my design wall in my studio. I listen to vinyl all the time. In my house and design studio and in my stores, we have turntables. It’s a warmer sound and a different experience. There’s something very convenient about digital music, but there’s also something very impersonal about it. It’s too easy to flip through everything. When you listen to a whole side of a vinyl record, the experience is very different from listening to one song. // How is the East Hampton store different from your New York stores? It’s more casual, more weekend, more beachy. It’s not a formal store. We don’t carry much in suits or shirts and ties. We sell a lot of accessories there, and a lot of shoes and leather jackets. // Have you thought about going into women’s wear? I think about it all the time, and it will happen at some point. In the world today, I feel that focus is an important thing. Guys like shopping at our stores because it’s just for guys. They come in with their girlfriend or their wife and they don’t have to feel like they’re sharing it. It’s all about them. There are not a lot of places in the design world that are like that. // Do you have plans for expanding? We want to open more stores and we’re talking about adding a home collection. I’m working on a book right now, on music and fashion. // So, are you living your dream? Yes, I think so. I love what I do. I have my family, my work and my music, and I feel: How lucky am I? 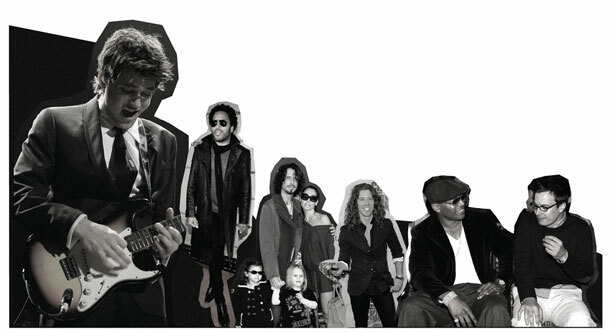 Pictured from left to right: John Mayer by Jordan Strauss, Lenny Kravitz by Dimitrios Kambouris, Chris Cornell and family by Jordan Strauss, Shuan White by Frazer Harrison, LL Cool J and Jimmy Fallon by Scott Wintrow.